In his most recent round of puzzle offerings, Eric Fuller offered a couple of designs by Yavuz Demirhan. Being Burr type puzzles I wasn't overly interested myself (so why I picked up a copy of the Cutler Cube I'll never know), however a good puzzling friend in the UK was interested. Postage was going to cost as much as the puzzle though, so I offered to have it thrown into my box, with the offer to bring it to the UK when I'm there later this year. As a bonus, I was allowed to play with it. 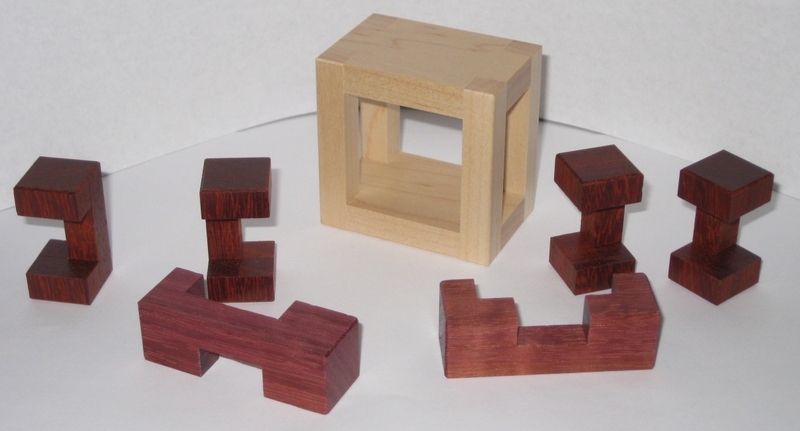 As you'd expect this small puzzle is crafted to Eric's high standards and measuring in at 2.25" x 2.25" x 1/5" the pieces are a good size to manipulate through the cage, and it doesn't feel fiddly, unlike some of the smaller wood/acrylic puzzles Eric has been making recently. The cage is made from Maple, and you might be forgiven for thinking that the pieces are all the same wood. 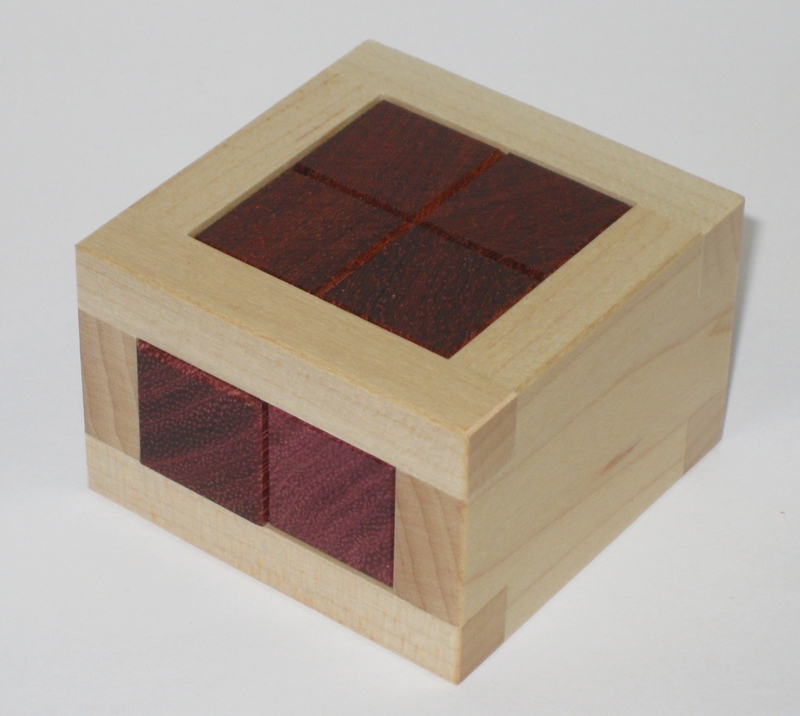 The shorter four pieces are Paduak and the longer two are Purpleheart. To be honest, the difference in colour between the pieces is not strong at all, but that certainly doesn't detract from the puzzle. At a level 18 burr, meaning there are 18 moves needed to remove the first piece, this is the sort of puzzle I wouldn't normally pick up to play with myself. Having said that I'm glad I was able to play with it. The four pieces in the centre (top) of the puzzle are identical, and the two longer pieces which run horizontally through the cage interact with the shorter pieces to create a sort of dance as you slide the pieces back and forth, up and down to create the space you need to remove the first piece. After a little experimenting, most people should be able to find out how to create the space needed to remove the first piece. After that the rest comes apart pretty quickly. Putting the puzzle back to the solved position is simply a case of reversing the steps, but I can assure you that's easier said than done if you mix the orientation and position of the two longer pieces. This is a great puzzle design, and certainly one that I'd recommend you have a play with. Even if you're like me and not a huge fan of Burr type puzzles, this one is accessible, and even enjoyable for the average puzzler.